Electrical code calculator that Compliant with 2017, 2014, 2011, 2008, 2005, 2002, 1999, 1996 NEC®. Electrical contractors, electricians, air conditioning installers and lighting specialists solve tough electrical calculations in seconds and deliver those solutions conforming to the latest NEC. Easily solve calculations in seconds, including wire and conduit sizes, integrated voltage drop, motor full-load amps, fuse and breaker sizes, parallel resistance and more. The ElectriCalc Pro is a complete electrical reference tool that will save you time and money. Users can update to future NEC revisions with an easy-to-install kit. 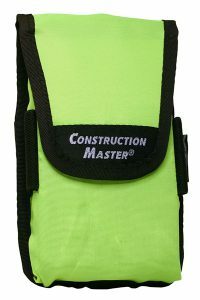 Includes Armadillo Gear protective case. 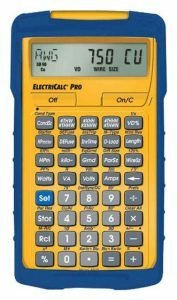 The ElectriCalc Pro electrical code calculator 5070 from Calculated Industries can help you solve tough electrical calculations in seconds and deliver those solutions in conformance with the latest National Electrical Code (NEC). The ElectriCalc Pro is a complete electrical reference tool that will save time and money. Update to future code revisions with an easy-to-install kit. 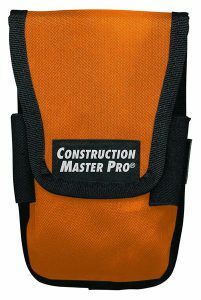 Includes a rugged Armadillo Gear 360-Degree flip-top cover protective case--perfect for work out in the field. Find Motor Full-Load Amps per Current NEC®. Works in 1Ø and 3Ø with the new expanded tables for 3Ø induction (to 500 hp) synchronous (to 200 hp) and DC motors per NEC®. * NEC 2017 Compliance Notice. The 2017 NEC Code has been examined and there is one change in the 2017 NEC Code that impacts the functionality of your ElectriCalc Pro Model 5070. Installing the new chip and setting the calculator to NEC 2017 will make it fully compliant to the new code. This is an excellent electrical code calculator IF you invest the time to become proficient with it. This time can be specific study or just a commitment to use it until you’re comfortable and competent with it. Otherwise you will, like I did the first time, end up with it just sitting in a drawer. The calculator is as good as the 1993 version I once had but the instructions to perform different functions are vague. Not always keystroke by keystroke. This calculator has replaced 8 tables from the NEC pinned up on my board. Not only fast, but it has uncluttered my ofice. This electrical code calculator helps me perform calculations faster which helps me get jobs done faster. This is one of my best purchases so far this year. I'm currently in school to prepare for my journeyman electrician's exam. This calculator makes my homework so easy that I had to go back to doing the math long hand so I wouldn't get out of practice. I doubt if the ElectriCal Pro is allowed in the exam but if I do pass I will definitely use this calculator in the field. It does everything.